Vote: Should all English football fans support Man Utd? English fans of “Anyone But United” want Barcelona to win. Is that a good thing? As I write this post with Radio 5 Live on in the background, all I can hear is angry Scousers and Gooners, talking bitterly about how much they want Man United to lose tonight’s Champions League final. Yep, the Anyone But United brigade is out in full force. I understand exactly why non-United fans hate the champions – “such an arrogant club”, seems to be a common theme – but shouldn’t English fans support an English club in Europe? It’s an age-old question, and I’d be interested to hear who you’ll be cheering for in Rome. I’ll be cheering for United, as I admire the way they play football. Plus, call me old fashioned, but I always want English clubs to do well against European opposition. 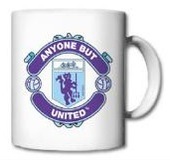 I know that the concept of Man Utd as an English club may be outdated, but that’s the way I’ve always been. I’m not english, i can’t pick anything. Damn. How about the option ‘Barcelona – I’m NOT English and not a Barca fan’?